Your frequently asked questions - answered! Trust My Garage is an RMI-backed, consumer focused programme designed to raise the awareness and perceived quality of independent service & repair garages in the UK, while providing consumers with total confidence in the work being advised and completed. This is a unique programme as it is free to current RMI members, and has no ties to other products and services. It brings added value for consumers using recommended garages by providing such things as automated reminders for service, MOT, road fund licence and insurance as well as special offers and advice relevant to them. Assure your customers by letting them know that you are a part of a nationally recognised brand. Who are the Independent Garage Association? ​The RMI’s Independent Garage Association is the largest and most prominent representative body in the Independent garage sector. 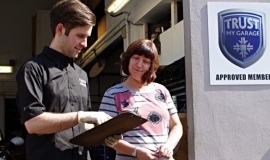 The IGA aims to support and encourage independent garages to thrive in all aspects of their business by offering advice, information and services which ensure that the independent service and repair sector can remain efficient and competitive in an increasingly complex business landscape. The IGA is one of the member organisations of The Retail Motor Industry Federation (RMI) is the UK's leading automotive trade body and one of Britain’s oldest motor trade organisations, representing franchised car and commercial vehicle dealers, independent garages, bodyshops, motorcycle dealers, petrol retailers, auction houses and cherished number plate dealers, who provide sales and services to motorists and businesses across the UK. ​What’s in it for my business? The Trust My Garage scheme presents a unique opportunity to promote your business to both existing and prospective customers, offering them a level of service second to none, at no extra cost to you or your business. The scheme also provides for those without an all-important web presence, consistently ranking within the top 10 search results on Google. ​Will there ever be a charge for membership? No. Basic membership will remain free for IGA members carrying out service & repair as part of their annual subscription. ​Why Trust My Garage? Why not other consumer codes? Trust My Garage is the first and only CTSI-approved consumer scheme specifically for independent garages. It is free to current RMI service and repair garage members, and is part of a nationally recognised brand of quality assurance. ​What requirements are there to qualify for membership? By registering for Trust My Garage, you are expected to adhere to the CTSI-approved Trust My Garage Code of Practice relating to service & repair. Within membership, there is also a requirement to sign up to, and honour, the Trust My Garage Customer Charter, which must be prominently displayed at all times. Membership will mean a commitment to constant improvement of your business and to ensure that all staff are fully trained and supported in their personal development, and that you will meet or exceed the Trust My Garage Customer Charter. What are the benefits of being a Trust My Garage member? ​The primary benefit will be more customers through your door. Trust My Garage marketing has been developed, along with both free and low-cost contributory marketing and point-of-sale materials. Second and third stage developments will enable you to contact your customers as part of the service, e.g. the reminder system built into the website. More customers, fewer costs, free advertising, web presence and more profit are all guaranteed benefits of membership – not to mention the opportunity to be a part of a nationally recognised brand. Sounds great! How to I register? ​We have two methods for registering interest in the Trust My Garage scheme, both designed to be as simple as possible to complete. One method is to contact our member services team in Rugby on 0845 305 4230, where they will be happy to do this for you over the phone. The second method is to register online. Your membership number will be your current RMI membership number and your password will be generated for you. Once you log in you will be taken to your garage account page, where you can upload many details about your garage, which consumers will see on your garage profile page. When registering, you will be asked to provide some key information regarding your business e.g. address, contact name and phone number. We will also give you the opportunity to supply us with details about the goods and services you offer such as MOT and exhausts etc. From there we will arrange for a member of our auditing team to come out and assess your business, to get your application approved as soon as possible. Audits are categorised into 5 sections; facilities and branding, customer care and process, technical scope, legislation, and equipment. ​What does continuing Trust My Garage membership mean? Continuing as a Trust My Garage member means consistent commitment to the Trust My Garage Customer Charter and the RMI Code of Practice. Trust My Garage periodically carries out audits on its members to ensure that our high standards are being met. If you fail to meet the requirements of the registration process, you will not be permitted to join Trust My Garage. We will, however, work with you to help you meet any criteria you fail. Your membership can be suspended and revoked if you fail to honour the programme. Again, we will work with you during this process to ensure full compliance. ​How can I find out news and progress with Trust My Garage? You will receive communications from us via email, and you can always check our website or phone our member services team on 0845 305 4230.